The layoff was barely noticeable. The rust factor was minimal. Middleton’s girls basketball team, which had a 10-day break, returned to the court on Jan. 19 and routed visiting Madison West, 71-29. Senior center Hannah Flottmeyer led the way with 21 points and 15 rebounds, while junior forward Sitori Tanin added 17 points and 14 rebounds. The Cardinals improved to 10-5 overall and 8-2 in the Big Eight Conference, one-game behind league-leading Sun Prairie in the loss column. West fell to 1-14, 0-11. Middleton, which can make a living with its pressure defense, played the entire game without pressing to work on its man to man defense. BROOKFIELD — Middleton senior guard Sam Close left Brookfield Central High School on Jan. 19 with a T-shirt for being chosen as the Cardinals’ Player of the Game. Many of Close’s teammates left town with ice cream after stopping at a legendary frozen custard restaurant. Aside from that, Middleton’s trip east yielded one giant headache. The Cardinals never found a rhythm offensively, shot just 25.5% and dropped a 55-39 decision to Muskego at the Luke Homan Memorial Showcase held at Brookfield Central High School. Close led the Cardinals with 16 points, including three three-pointers. Middleton, which defeated Verona less than 24 hours earlier, fell to 9-6 overall. Muskego, which had several players from its state championship football team, improved to 10-4. Middleton boys basketball coach Kevin Bavery knew that facing Verona on Jan. 18 was a challenge his Cardinals couldn't take lightly. Verona, which sits near the bottom of the Big Eight Conference standings, had won three of its last four games. And the Wildcats are coached by former Middleton assistant Javin Budde, who knows the Cardinals inside and out. The teams were deadlocked at 39 late in the contest. But Middleton finished on an 11-1 run and toppled the Wildcats, 50-40, at the Coaches versus Cancer game in Middleton. Middleton improved to 9-5 overall, 6-5 in the Big Eight and snapped a two game losing streak. Verona dropped to 4-11 overall and 3-8 in the Big Eight. One sign of a great team is how it rebounds from adversity. Using that as a barometer, it’s more than fair to use the word “great” with Middleton’s boys swimming and diving team. The Cardinals, ranked No. 2 in the state, fell to top-ranked Madison West, 104-66, in a Big Eight Conference dual meet Friday. Less than 24 hours later, though, Middleton won the highly-competitive 13-team Cardinal Relays — an event that included No. 1 Madison West. Middleton finished with 180 points and outdistanced the second-place Regents (168). Madison Memorial (157), Verona/Mount Horeb (156) and Arrowhead (146) rounded out the top five. Fortunately for the Cardinals, Saturday went much better. Middleton’s boys basketball team experienced a tale of two halves on Jan. 12. The host Cardinals went toe-to-toe with Madison East — the state’s No. 1 ranked team in Division 1 — in the first half of their Big Eight Conference battle and trailed just 28-27 at the break. The second half, however, belonged to Madison East. The Purgolders put on a defensive clinic and put Middleton in a hole it couldn’t climb out of. East switched its defense in the second half, which proved to be too much for Middleton’s offense. The result was East pulled away and notched a 64-47 win. Middleton fell to 8-5 overall and 5-5 in the Big Eight after losing its second straight game. East improved to 14-0, 10-0. East won both games against Middleton this season, also winning 62-43 on Nov. 29. Protect the ball. Play at a controlled pace. Feed the bigs. If only the execution was that easy. 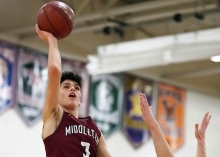 Middleton’s boys basketball team went to Madison La Follette on Jan. 10 to face a Lancers team that plays in fifth gear and tries taking teams out of their comfort zones. Unfortunately for the Cardinals, La Follette’s style of play won out. Middleton had 29 turnovers and let La Follette dictate tempo in what eventually became a 65-46 Lancers win. The Cardinals had their six-game winning streak snapped and fell to 8-4 overall and 5-4 in the Big Eight Conference. La Follette improved to 8-3, 7-2. Off nights are no longer an option. Bad games need to be a thing of the past. That’s the mindset of Middleton’s girls basketball team, which has great expectations in the second half of the season. The Cardinals, who are still in the running for a Big Eight Conference title and a No. 1 seed in the postseason, notched a huge win on Jan. 8 that could go a long way towards keeping those dreams alive. Middleton jumped to an 11-point halftime lead and held off host Madison La Follette, 55-50. The Cardinals improved to 8-2 in the Big Eight Conference, one game behind league-leading Sun Prairie, and are 9-5 overall. The Lancers fell to 7-3, 10-3. Tom Cabalka’s path to becoming a coaching legend was highly unorthodox. And it’s certainly not recommended at home. In the fall of 1971, Cabalka was a junior tight end at the University of Iowa and was off to a terrific start. In just the fourth week of the season, though, Cabalka suffered a broken neck. Cabalka missed the rest of the 1971 season, then redshirted in 1972 when he also helped the Iowa coaches. It was then that the 21-year-old Cabalka could see his future. Luckily for the folks at Middleton High School, it was option No. 2.